If your server has crashed and all of your attempts to repair the system have failed, you may need Server Data Recovery. The data that is contained on the server’s volume must be obtained, so that it can be migrated into a new system. Mass Data Recovery has experienced specialists and support staff to help you recover from this potentially disastrous server data loss. Our professionals will help your company get back up and running with minimal down-time. 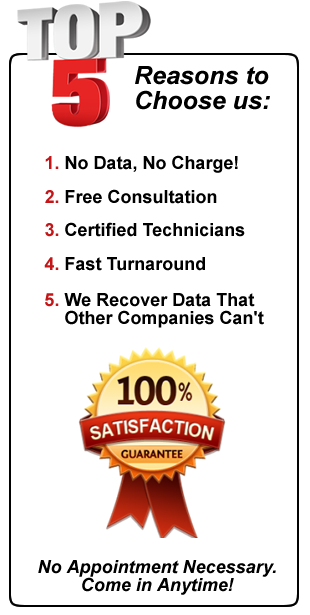 Mass Data Recovery has performed hundreds of server data recoveries over the years. These recoveries include both logical and physical server failures. Server data recovery is typically much more involved than a classic hard drive failure. The complexity is highly dependent on the type of storage used on the server. Some servers utilize RAID technologies to add data redundancy, speed and space. This type of storage can complicate the server data recovery process, especially if this is the root cause of the failure. In that scenario, the RAID would need to be repaired and recovered in order to gain access to the needed data. There are a number of different types of failures that can cause a server to fail. For this reason, it is very important that you send your valuable data to a company like Mass Data Recovery, where the recovery can be performed in a safe and secure manner. It is evident that there are many factors that may contribute to a hard drive failure. If your Server is experiencing failure symptoms, we are able to help. We pride ourselves in our ability to recover data from any type of failure. We are not limited by the complexity, brand, size, or manufacturer of your hard drive. If you suspect that you are in need of Server Data Recovery, taking certain precautions can dramatically increase the chances of a successful recovery. Continuing to power up a failing hard drive can cause irreversible damage and may result in an unrecoverable hard drive. If your server shows symptoms of failure, discontinue use immediately. Over time hard drives are bound to fail. There are two main types of hard drive failures. The most common is a logical failure. The second type of failure is a mechanical or physical failure. The hard drive’s internal components are functional, but other complications make the data inaccessible. The integrity of the data is compromised and the stored data is damaged in some way. Common causes of logical hard drive failures include accidental formatting or deletion of files, corrupt or missing partitions, operating system errors, a corrupt file system, or a computer virus. Hard drives contain internal moving parts. When a mechanical or physical failure occurs, one or more of the internal components has malfunctioned. The drive may be experiencing difficulty spinning or, in some cases, it may not spin at all. This will result in data that cannot be accessed unless the drive is opened. This requires a clean room environment where the hard drive can be rebuilt mechanically. Common causes of mechanical hard drive failures include head crashes, alignment issues, a broken motor, or spindle problems. The initial evaluation usually takes between 1-3 business days depending on the extent of the damage. Upon completion of the evaluation, you will receive an exact quote for the recovery. We will also provide you with the estimated time to completion and probable success rate. You can stop by anytime. An appointment is not required. Level one Server Data Recovery is when your hard drive is working properly but there is other damage to the computer. This prevents you from accessing your data. For example, you spilled liquid on the computer and it no longer turns on. As long as the drive wasn’t damaged by the liquid, this would qualify as a level one recovery. Level one recoveries are usually completed within 2 business days. This often requires complete disassembly of your machine in order to gain access to the drive. Once the drive is removed, it will be tested to confirm that a level one recovery is possible. If so, we will transfer all of the data to either an external hard drive or to another computer. The more data there is on the drive, the longer the transfer will take. Level two Server Data Recovery is where about 80% of our clients fall. In this case, the drive has started to fail but has not yet suffered a catastrophic failure. If the computer powers on but does not boot, hangs, or flashes a folder icon then it may qualify for a level two recovery. However, not all drives with these symptoms will be recoverable using these techniques. We are usually able to extract the data from the failing drives using specialized level two recovery tools. Failing drives are very delicate and must be handled properly. A level 2 recovery attempts to recover as much data as possible before the drive suffers a complete failure. Upon completion, you will be able to review the recovered data and confirm that it has been recovered to your complete satisfaction. If you are not satisfied, there is no charge for the attempt. About 15% of our customers have no other option aside from a level three Server Data Recovery. This is the last resort when dealing with severely damaged drives. It can also be used as a safer alternative to level two methods. At this level, the drive is sent into our clean room laboratory for extensive reconstructive work. The parts inside of a hard drive are incredibly delicate and can be easily destroyed with one wrong move. These recoveries can be considered the equivalent to open heart surgery. They are very complex and require great skill and precision. Before files can be restored, the drive must be disassembled and repaired. This must be done in a special environment in order to prevent damage to the data. A Class 100 clean room is necessary to safely complete a level 3 repair. Exact matching donor drives must be used to restore the patient drive. Once the data can be read properly, the file system reconstruction can begin. Depending on the extent of the damage, we can often recover all or most of the data. What is the price of the recovery based on? Although many factors determine the cost of data recovery, it is based primarily on the level of damage to the hard drive. Detailed reconstruction is often required to get the drive back to a point where the data can be read properly. Once the drive has been rebuilt, successfully extracting the data is the easiest part! Whether its one file or a million files, the work required to get a drive operational is the same. As such, the amount of data usually doesn’t affect the price. Mass Data Recovery uses a Class 100 clean room for hard drive data recovery. A Class 100 rating means that the company has followed federal standards for air quality control. For more information on our clean room, click here. For more information about Server Data Recovery & pricing, just give us a call. For directions and service center hours, click here.